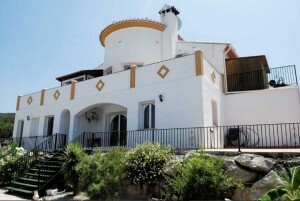 Casa Los Prados is an impressive detached villa located on an exclusive development of just five properties. A very modern style, two storey property, the location is very convenient for the amenities in both Puente don Manuel and the village of Vinuela. All mains services are connected, including tarmac roads, street lighting and mains waste. The property has a gated entrance with ample off road parking and a car port for shade. Through the main door you enter a lounge area with a bow front and direct access on to the front balcony. The kitchen is ultra modern, including granite work surfaces, some innovative storage space, a dispenser and access via patio doors in to a small conservatory. There is one bedroom located on this upper level as well as a general bathroom. Via the internal staircase you may access the lower sleeping accommodation where you will find two ensuite bedrooms, a separate utility and two access points on to the outdoor terrace and the landscaped pool area. Views span across to Zafarraya Pass and Mount Maroma, and privacy levels are good. The pool is an 8 x 4 rectangular in shape with roman steps and gardens are low maintenance but functional. There is a storage shed which has been added on to the side. Key extras include gas central heating throughout, reversible AC throughout, designer sanitary ware and tiles, new furniture, etc.